The geometry of the object. . . 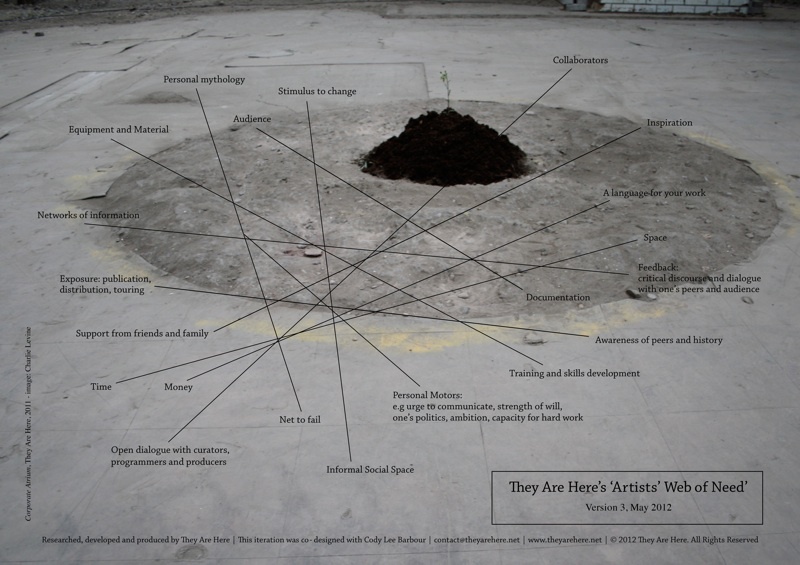 They Are Here’s Artists’ Web of Need can be considered a self-diagnostic tool for artists, groups, organisations and institutions supportive of artists. Inspired by Maslow’s Hierarchy of Needs, TAHAWON is an open and evolving project and dialogue. It has already undergone three iterations since 2011. TAHAWON is also a self-reflexive and self-referential artwork - exploring and mapping the production of art and the needs of its producers. The work comprises a diagram overlying a photograph of our work Corporate Atrium, 2011, a site-specific sculpture made in a temporary independent project space due to be converted to offices. A weed in the corner of the project space was replanted in its centre and sustained through water and high nutrient soil. TAHAWON intends to be both parodic of corporate office culture, as well as a genuine resource. Designed in collaboration with Cody Lee Barbour.